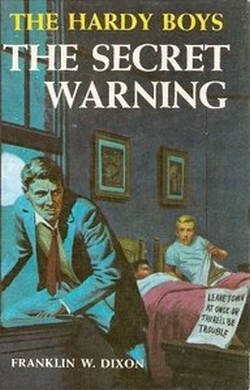 bayport beat Season’s Greetings and welcome to the December edition of The Hardy Boys News with a look at new & upcoming releases and the book of the month, “The Secret Warning”. I’d also like to announce my new Series Books Sales Page! Notes: In 1941 the text on page 219 was altered to include the title of the next book. 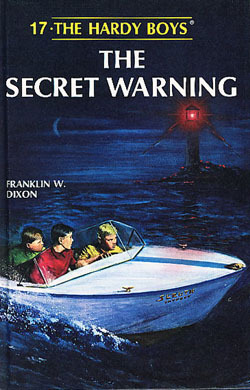 The Hardy Boys go deep sea diving to recover the treasure from the sunken “Katawa” and foil the plans of the thuggish Gus Kuntz. 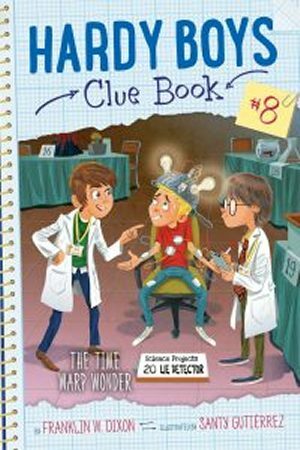 Revised: The Hardy Boys investigate the strange disappearance of an ancient Egyptian artifact. 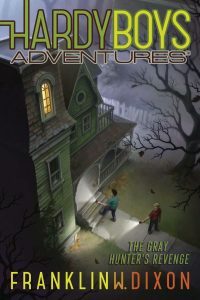 Description of current edition: Strange events involve Frank and Joe Hardy in a mystery which shrouds an ancient treasure-the golden head of the Pharaoh Rhamaton IV. The owner of the million-dollar golden Pharaoh’s head claims it was aboard the freighter Katawa, which sank not far from Whalebone Island. But suspicious developments indicate that Mehmet Zufar may be trying to defraud the shipping line’s insurance company. 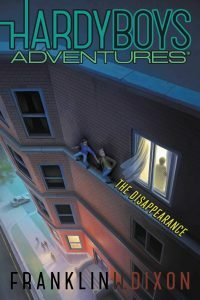 Frank and Joe enthusiastically accept the challenge of their famous detective father to assist him in investigating the complex case for Transmarine Underwriters. While not as flawed as some of Dr. Button’s later attempts, (including The Mystery of the Flying Express, and, of course, The Disappearing Floor), The Secret Warning had its share of peculiar literary decisions, which I’ve chosen to exaggerate here, possibly to humorous effect. I hope you enjoy it. Frank and Joe exchanged perplexed glances. The stout boy laughed good-naturedly at this latest crippling blow to his self-esteem. Just then, Frank glanced up and saw a tall, lanky figure walking on the dock. Realizing how valuable the skills of a deep-sea diver would be to repairing the Sleuth’s motor, Frank called Mr. Perry over to the boat, and explained their dilemma. “Have you tried tapping on it?” suggested the lanky diver. Soon, with four heads proving marginally better than three, the Sleuth’s motor was purring like a kitten. With Chet at the controls, the stout lad began to move the boat a foot or two. Suddenly, as if to add action to the story, the Sleuth impacted another motorboat which, for some reason, no one had noticed directly behind them. The jolt of the collision sent Perry hurtling into the water. 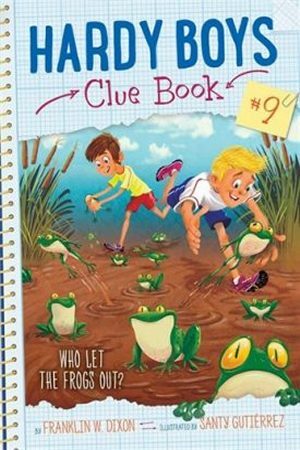 Chet, while humiliated by his obvious incompetence, was nonetheless relieved not to have been, for once, the one who ended up in the water. “You’ll pay for this!” snarled Bock, one of the two collision victims. “Yeah, we’ll get you Hardys through a series of empty threats and petty vandalism,” sneered Simon, as he piloted the other boat to safer waters. “I don’t like their looks,” drawled Chet, an opinion which would be shared by most everyone the Hardys would speak to in the foreseeable future. “Chet, since when do you have a drawl?” interjected Joe. “I do seem to be drawling a lot lately,” drawled Chet. “I wonder how those fellows knew our names,” mused Frank. “I have a hunch that will never be explained,” predicted Joe. Eventually, Frank, Joe and Chet got around to rescuing Mr. Perry, who, fortunately, had not been wearing his thirty-two pound diving shoes at the time. 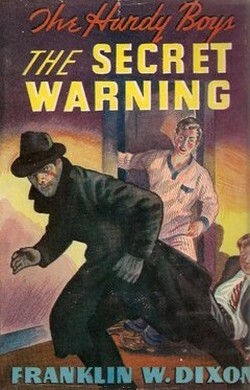 As it turned out, Mr. Perry had originally been on his way to keep an appointment with Frank and Joe’s father, Fenton Hardy, the world-famous detective. This could hardly be considered a coincidence, since no one ever came to Bayport except small-time smugglers and clients of Mr. Hardy. The boys escorted Mr. Perry to their home, where Mrs. Hardy insisted on providing the dripping diver with some dry clothing. “That’s very kind of you,” expressed Mr. Perry. “A T-shirt and an old pair of sweat pants will be more than enough.” But Mrs. Hardy, who had a “thing” for tall, well-dressed men, insisted that the near-total stranger wear her husband’s favorite tweed suit (along with his new Van Husen button shirt, his favorite necktie, and a pair of cufflinks that had been given to Mr. Hardy by his late grandmother). After force-feeding Mr. Perry a huge dinner, capped off by multiple apple pies, it had become obvious that Mr. Hardy was displaying his usual lack of punctuality. “I’ll try to contact Mr. Hardy some other time,” lamented Mr. Perry. “I guess there would be no reason for me to leave my phone number, or address, or any way at all for him to contact me. But dinner was lovely. And thanks for the swell suit!” And with that, the now-well-dressed diver took his leave. “Welcome home, Dad! Gee, it’s great to see you,” gushed Frank and Joe to their father. Mr. Hardy’s famous exploits had once caused him to neglect his sons for weeks at a time. Now that Frank and Joe had demonstrated considerable talent as amateur detectives, Mr. Hardy often let his sons assist him on important cases, putting them directly in harm’s way. “What kind of case are you working on, Dad?” inquired Joe excitedly. “You mean in your wall safe,” guessed Frank. “Or your file cabinet or desk drawer,” speculated Joe. Frank and Joe exchanged nauseated glances. Fenton Hardy paced the room like a caged lion. Time was running out. If the boys didn’t recover his notes, he would be in a terrible jam. If only he could remember some of the pertinent details of the case, such as who the client was, or what he was supposed to be investigating. No, it was just no good. Too many whacks on the head from too many criminals. He would have to wait to hear from Frank. And the other one, the blond fellow. The famous detective was ruminating on how the blond boy didn’t really look very much like him when the phone rang. He snatched it up anxiously. “Hello? Dad?” came the voice on the other end. It was Frank. Mr. Hardy breathed a sigh of relief. The boys had come through for him! “Well, at one point we came across an elderly woman who had apparently fainted; we took her to the doctor,” continued Frank. “Was she with the old man who lost his cane?” queried Mr. Hardy. “Murder! Frank, what in the world are you talking about,” gasped Mr. Hardy, who was rapidly becoming exasperated. “Not the jacket that contained the notes?” croaked the detective, his voice all but inaudible. “The two fellows whose boat we rammed the other day,” explained Frank. Fenton Hardy let loose a pitiful cry of anguish. “Anyway, we finally managed to get the notes back from Bock, Simon, and their boss, whose name I don’t think I can say over the phone, so we’ll be sending them to you right away, Dad,” Frank announced triumphantly. He heard no reply on the other end other than a low sobbing. Then came a sharp click and the droning of the dial tone. “Was Dad proud of us?” Joe asked his brother. “I’m not sure. I guess we were cut off,” theorized Frank, replacing the pay phone’s receiver in its cradle. Frank and Joe exchanged humorous glances and all three boys shared a hearty laugh.